In December, at the end of a roller coaster year, I made one last decision. The more I found out about the current state of academia in the UK, the more I realised that if I wanted to follow that path, I'd have to give it 100% of my time and energy to stand a chance. I couldn't do it while giving half - or even a quarter - of myself to food and to this blog. When I decided to go back to Oxford, I thought I'd be able to balance both, as I had as an undergraduate. But it was far more of a strain than the first time. I struggled to make it work and it became clear that I couldn't keep doing it forever. Uncomfortably familiar essay writing demons came back to haunt me and I spent entire days silently fighting them. Despite the fact I love the subject and enjoyed my tutes and classes, apart from two weeks in the middle of term, I wasn't very happy. First, I decided that I didn't want to apply for a PhD. Then, a few weeks later, after lots of thinking and talking, I left the masters. I was self-funding and living out of college so it was almost absurdly easy to stop. It feels like I've made a ridiculous amount of decisions in the last year. I get nervous and a bit embarrassed every time I have to tell people about a change. I guess I think they'll laugh or think less of me. Yet I have no regrets. I had to try postgraduate study to see what it was like - it felt like I couldn't go forward without experiencing it. But in the end, blogging is non-negotiable. I won't give it up. One of the other reasons I left was that I had an attractive alternative plan. My mum is a one-on-one private tutor in maths, sciences and various other subjects for an international mix of students. Some come for a handful of hours, some come out of school to be taught solely by her for a term or two. Most are on holiday in Verbier anyway but a few fly out just to see her. She's a gifted teacher. As I've grown up, I've been tutoring too - it's been eight years now, on and off. The plan is to spend a few months of the year in Switzerland, mainly in the school holidays, working alongside mum. I'm taking on some of her waiting list and adding extras for literature. Between us, we can teach almost any school subject. Family businesses don't seem very fashionable these days but I like being part of a team. It's rewarding work and it means I can stand on my own two feet. I've just finished two busy weeks of work. The majority of my hours were spent teaching A Level English Literature (in the UK you usually choose three subjects to study in detail in your last year of school, age 18). I hadn't done a huge amount of that level before and I've enjoyed it so much that it's already justified my choice. Tutoring takes two of my favourite parts of studying - reading and talking about literature - and combines them with teaching, which I've always enjoyed. Watching the confusion fade and the text open up for someone is wonderful and there's nothing better than when they start getting excited by it and begin to trust their ideas and thoughts. And after all, being paid to talk about Shakespeare and Milton is pretty dreamy. The best bit is that I'm then free to spend the rest of the year in Oxford working on food projects. The tutoring will take the pressure off the food by paying the bills. I'm looking into more freelance magazine work and I'm mulling over new book proposal ideas. This time I'm going to take things slowly. swings hard and high in one direction - sometimes wildly, at speed - yet the moment it peaks it inevitably starts moving back down the curve again and more and more of the other side creeps in. I'm hoping that my plan will take advantage of the momentum and harness the periods of alternating inspiration - and in doing so, give me some peace and control. This loaf is mum's creation. We had some dried figs and apricots that I'd stewed with vanilla sitting neglected in the fridge. She was making our old favourite Irish Tea Loaf and decided to toss the stewed fruit in. It took me several attempts to recreate that original chucked-together loaf as she isn't the best at writing things down and will happy double or treble things like pecans if she wants more nuts and then promptly forget how many she put in. It's something to bake on a quiet day at home - a Sunday, perhaps. None of the steps are complicated but it does take a bit of time to simmer, cool and bake. It makes up for this by keeping for ages and being really easy to tuck into a pocket or bag for a satisfying snack. I took some for the plane yesterday (from the loaf before this loaf) and it gave me plenty of energy to get through the journey. I can't put my finger on why I love this recipe so much. It's a bit odd and doesn't fit. It's not really cake but it's not bread either. It's much better than normal fruit cakes (and I like fruit cake). It's loaded with tea-soaked fruits and toasted pecans. It has this sweet, crunchy outside that's almost shiny - I reckon it's because you make the sugar into a syrup. We eat it in thin slices with curls of cold salted butter and cups of steaming Earl Grey. P.S. I had a photography issue which meant I couldn't post until I got back to the UK - apologies for the delay. Tip the apricots, figs and sultanas into a saucepan. Split and scrape the piece of vanilla pod and add the pod and seeds to the pan. Stew the tea until it's a deep reddish-amber then pour over the fruit. Place over a very low heat, cover and cook for 1 hour until plump and soft - stir occasionally. Leave covered to cool. Preheat the oven to 170C. Line a 9x5" (or similar size) loaf tin with baking parchment or lightly greased foil. Place the pecan halves on a tray and toast in the oven for about 5 minutes until they smell good and darken slightly. Chop the pecans into small chunks and leave to cool. Drain the fruit, saving the little bit of liquid left - I usually have about 50ml. Top up to 80ml with water and tip back into the pan. Add the sugar and salt and place back over the heat. Stir until the sugar has dissolved then pour into a big mixing bowl. Cut the apricots and figs up into small chunks. Stir the fruit and nuts into the sugar syrup. Beat the egg then add to the bowl and mix in. Sift the flour and baking powder over the top then stir in - it will be pretty stiff. Add the milk and stir until all the milk and flour is combined. Scoop into the loaf tin and smooth out. Place in the oven and bake for an hour until a toothpick inserted into the middle of the loaf comes out clean. After 40 minutes you may need to cover the loaf with a bit of foil to stop it browning too much. Cool for a minute then remove from the tin and lining and leave to fully cool on a rack. Keeps very well in a tin - at least a week. For me, your blog is always so lovely, refreshing and honest. I hope to find the balance between creative and academic and your path, although unplanned seems like a wonderful one to be taking. Your blog is forever inspiring me, thank you for always writing beautiful words. Congratulations on your decision. As somebody that is also constantly oscillating between academia and the love of baking, I can tell you that it takes a lot of courage to take a step such as the one you took. Today, five years after receiving my PhD, I find myself still in academia and putting in a tremendous effort to reach my goals. At the same time I am still harboring the nagging thought of whether I am doing the right thing, and wouldn't I be better off and more in peace, baking to my heart's content. I hope you find fulfillment, and don't forget that as long as you are loyal to who you are, you can find satisfaction in any path you chose. Good luck Emma. To be a really good teacher is an exceptional talent. I'm sure this is a first small step on a wonderful journey. Lovely piece, lovely recipe and some compelling thoughts about food and work. I too teach, and go through periods of intense resistance to it, only to return. I think ultimately what I feel is that the learning goes both ways, and there is much to be gained from simply sitting with someone and having a conversation. Good luck in your teaching adventures. Sounds like you've made a really good decision Emma! I know you were very torn about it when we met but this does seem like the option that will make you happiest :-) This loaf looks lovely - you can't go wrong with an adaptation on a classic Delia! Your loaf cake looks lovely, I fancy baking it on a weekend and eating it curled up by the woodburner. Sounds as if you've made some good decisions and worked out a good balance of things you enjoy to concentrate on. A friend of mine talks about 'patchwork careers' in a very positive way and I totally agree - sometimes it's good to be able to fit together a mixture of different types of work and to let it evolve as time goes on. It can be much more interesting and flexible than thinking we have to stick at one career path indefinitely. Congratulations on your brave decision and your exciting new path. It feels scary to make the decision to leave a course but you shouldn't worry what people would think or feel embarrassed. You've taken a step to be able to spend time doing the things you love and that's amazing. On a food note, this loaf looks gorgeous. I love the figs and pecans peeking through the slice in the last photograph.Definitely the perfect recipe for cold days like today. 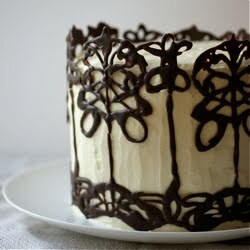 That cake looks absolutely stunning, I love the pattern the dried fruit makes in that slice, yum yum yum! This could've been a page from my own life, although I did finish my Master's degree (not self-funded, thankfully), but then it came time to think about the PhD. I wavered. It's easy to get caught up in path dependence and just keep following the flow. But I too realized it would engulf my entire being and, like you, realized it wasn't worth it. Every once in awhile I have a moment where I think, "Now that would be a great dissertation topic!" But all in all, I'm at peace with my decision, as it seems you are as well. It's a hard decision to leave academia - congratulations! Here's to many great future endeavours in food writing and related activities! Oh Lottie, what a wonderful comment. Thank you. It dispelled my nerves last night! I love that sentence about being loyal to who you are. It's easy to forget what is most important (and to think that who you are isn't right, or normal, or good enough). I hope you find peace and fulfillment too, whichever path you follow. Thank you Sally! Who knows where I'll end up. This feels like a great way to go forward at the moment. You're totally right that the learning goes both ways - it's a privilege to sit with someone and share ideas and thoughts. I've resisted it too - mainly from a teenage don't-want-to-be-mum and not wanting to accept opportunities that come through family, but I'm starting to realise that I was being a bit silly. Good opportunities should be taken! Thank you for your comment and I hope your teaching adventures go well too. I was in a bit of a muddle then! Though I had decided and it was sorted, but it was all a bit stressful and new. Where would I be without Delia - the original tea loaf was the first I ever made on my own as I wanted the Brownies cooking badge! Sounds like the perfect way to eat it. I really like the idea of calling it a patchwork career. I knew I probably wouldn't do the same thing for my whole life, but I hadn't really thought of mixing two things at the same time before. It's nice, as you say, to have some flexibility and balance! I'm usually ok once I've got over the initial step of telling people and they're all lovely about it. I think it stems from the fact that I left a lot of schools when I was a child (for various reasons, not all to do with me) and my extended family and other people made a joke out of it. Some even made bets on how long I would last at my secondary school! Though I won as I finished out the seven years ;) But anyway, I think that's where the nerves come from - it's nothing to do with the decision itself, really. It's exactly what you need on snowy freezing days! I hope you get around to making it, I think it's great. That's true - the book I adapted the recipe from is from the 1980s, but it's a very old idea. I'm never 100% sure about those tea chocolates and other tea desserts - I once made some Earl Grey ice cream that tasted like dirty dishwater! But in this it's perfect. It is easy to get caught up in a proper 'path' and the idea of a respectable, intellectual career. I also had a very rosy and nostalgic picture of my undergraduate degree that skimmed over all the trouble I had with my degree. My last memory being a surprisingly good end result that I'd never expected didn't help as it was suddenly a real possibility to continue. Once the door was open, I couldn't resist checking. But anyway, I'm glad you made the right decision for you too - as you say, it's a hard choice. Cheers! It sounds like this really is the best option for you (and for us if it means we get to keep you here!) Sometimes you have to give something your best shot to know that it's not right for you. Here's to the future! Emma! Wow this is big news. Good for you for being willing to make hard life decisions like these. Did I tell you that Paul did the same thing? He was getting his PhD at Berkeley when he realized that taking the academic route doesn't necessary lead to teaching (which he loves most). At least here in the US, most academics have to spend so much time researching and publishing that they don't get as much time in the classroom. So he quit the program and started teaching high school. He loves his life and it was a great decision. I know your mom loves to teach and her setup seems so creative, rewarding, and stimulating. I'm sure you'll be happy working together. And of course I'm selfishly happy that you'll be here cooking, shooting and writing for us. I live in Bishkek, Kyrgyzstan, and often interesting baking ingredients are hard to come by. (Or simple ones too - no such luck to find double cream here...) However, Central Asia is a bountiful land of sultanas, dried apricots, dried figs, one of the biggest walnut forests in the world (no pecans though, so this = a fresh local substitute) and lots and lots and LOTS of tea. In sum, this loaf is just perfect for bringing some tested creativity into my kitchen. I look forward to sitting down with this and a pot of local chai. "Spasibo bolshoe" from Kyrgyzstan! And "udachi" for your future journey. I admire your decision. I did the same thing with a masters degree a few years ago. It feels simultaneously sad and freeing. That tea bread looks gorgeous! so that it retains good quality. I will make sure and put your blog in the proper category and I'll also use, "Blogger: Poires au Chocolat" as your anchor text. Please let me know if this is ok with you by e-mailing me. Thanks! Ah, I think it might be hit or miss, if you're ever in Union Jacks try their earl grey tea and biscuits ice cream, its extraordinary (pizzas aren't half bad either! ), though it might be the only earl grey tea ice cream I've ever tried. The easy path to chose is the straight one, the direct one, that's what I chose. Reading this I felt a little jealous, as I am of many of my friends who have spent post-graduation time dotting about, trying things, finding their way. Whilst its easy to chose academia, watching my friends do PhDs it is clear how very difficult and wholly consuming academia is, I'm glad I've been able to learn its not for me by watching others, yet it still holds a certain allure. I admire your decision. True - I haven't tried many professional versions. I'll look into it when I'm next in London. Exactly - I wouldn't have been able to move on without giving it a good shot. Here's to the future! Wow! I'm so glad you can make it - even though there's only a few things you can't get in Switzerland that you can in the UK and vice versa, I know how annoying it is when you can't find ingredients. I'm afraid I know very little about Kyrgyzstan but lots and lots and lots of tea sounds like a very good thing! It really is - I love the flavours so much. I hope you have a really good 2013 too! That's funny! What years were you here? Or are you still here? I think it's pretty rare to know, especially the specifics. It is easy in some ways to go straight, but I don't think it's without merit at all - lots of my best friends have gone straight from uni into good jobs and are really happy. Easy doesn't have to be a bad thing - easy things can be easy because they're right, if you get what I mean.So I don't think everyone has to do the meandering route. PhDs definitely have a big allure, even though I know it's not for me now. Maybe later in life! I went to a conference about book conservation a while back and spent most of the day with a few retired ladies from the Bod and BL. One of them gave me some great advice - to work out what you need to do when you're young and are fit and make sure you do that first - anything else can come later. They were doing all sorts of awesome things. Emma, I once wanted to do a PhD when I was passionate about workplace design. To be able to fund it, I lived a very pared-down life for three years. I walked to work 45 minutes each way, cooked every meal I ate, etc, etc. One day, I fell madly in love with a little flat and my PhD fund evaporated into a deposit. Three years after that, I left my beloved flat in capable hands and packed my bags for London. You might not remember me, but we did meet briefly while I was also a student at Le Cordon Bleu. Life does feel like a pinball game at times. But, I'm sure you agree that the only way to go is with the flow. Good luck with your journey and thanks for continuing to inspire us! This looks a little like my mom's Cottage Cheese stollen -- she makes it with dried apricots, golden raisins and walnuts and would sometimes glaze it with a thin powdered sugar icing. Like your tea loaf, it is moist and just barely sweet. I will certainly be making this! Good luck to you in the new year with doing what you love best! Oh how interesting! I'm afraid I'm terrible with names so I can't work out who you are from LCB - are you still there? Pinball is a good way to describe it. So is it a bread made with cottage cheese? Or is that replacing the marzipan in the centre? Sounds fascinating! Hope you do get to try the tea loaf. It's actually NOT a yeast bread, but a "quick" bread using baking soda and the cottage cheese is mixed through. I could send you the recipe if you'd like. I think my mom originally got it from an old cookbook, and that's what's she's made for years. It is very yummy! I'd love to see the recipe! Could you email it to emma[at]poiresauchocolat.net? Or just post it here if that's easier. Hi, I just tweeted you about dashes and hyphens, which then inspired me to check out your blog...In short, I just wanted to say that this is such a refreshing post and that I really, really admire your decision and the strength that it probably took for you to make it. I'm currently writing a dissertation on Russian literature (this is my *third* year of writing and *seventh* of grad school, although, for my program, this is normal) and for the past few years I've been struggling with it, wanting to do something else (food related), but feeling torn about whether I should finish what I started...At the end of this semester--and hopefully the end of the dissertation, which I'm painstakingly writing at the pace of a snail--I'm planning on leaving the academic world for just the reasons you described. It's time for new challenges. In any case, thank you for sharing your experience! I'll do it this weekend while I'm making YOUR cake/bread! That's a lot of years! It's hard to leave something you've started. I thought about leaving my undergraduate degree a few times but something stopped me - sounds weird, but like an internal wall - I knew I couldn't. And I had a fantastic tutor who helped get me through it. And I'm so, so glad I finished it. I guess what I'm trying to say is that doubts don't mean it isn't right to finish - and it sounds like you're nearly there! But every situation is different and personal - only you can know what you really think/feel. The loaf, your writing - thank you. Hi Nicola - I don't really know what to say. I'm so touched. I wish you all the best and thank you so much for your comment. I rather like that piece of advice. I've read your blog for a long time now and baked many of your cakes, your tarts and so on. The recipes are always stunning and always turn out well. I always love to read a new post, not only for a new recipe but for your writing about your life, experiences you've made, they are always encouraging and enjoyable. This time I decided to make this teabread but it's the first time I actually changed the recipe. I swapped the tea for Darjeeling, left out the vanilla in the fruits but added some saffron to the beaten egg instead and halved the quantity of pecans and used some roasted pine nuts instead. The loaf turned out wonderful, it smelled devine and had a kind of orientalic feeling to it. I love to eat it toasted with butter. Thank you very much for giving us all enough self-confidence so we can try out new things ourselves. A marvellous loaf. I had to share it with friends or I would have eaten it all the day I made it. Great flavours and very easy to make. Thanks for a great recipe. Hi Emma, thanks again for sharing this wonderful recipe; I'm loving your blog and look forward to trying another recipe on here! I'm so glad you liked it, Liz - it looks lovely in the photos! aupair, Worldsharer is all about sharing your part of the world. It is about finding a room to stay in when you go traveling. Why live in a hotel when you can share a room in exchange for some help around the house. Maybe you have a spare room and want to meet a new friend from another part of the world. Made this tea loaf yesterday. It was the first thing I have baked in many years and it turned out brilliantly. I used hazelnuts instead of pecans and spiced chai instead of the Earl Grey tea. Absolutely delicious! I'm so pleased it went well! I love the idea of hazelnuts and chai, I'll have to try that.